A 7,500-year-old underwater water well that has been partially excavated from a site on Israel’s Mediterranean coast near Haifa will give important insights into the Neolithic society that once lived there. Dr Benjamin (left) and the Haifa University team clear away mobile sands covering the excavation site. Photo by J. McCarthy. 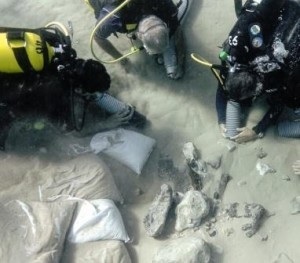 “Water wells are valuable to Neolithic archaeology because once they stopped serving their intended purpose, people used them as big rubbish bins,” Dr Benjamin, a leading expert in prehistoric underwater archaeology, says. “This is superb for archaeologists because it means we can look through the refuse of prehistoric societies – including animal bones, plant fibres and tools – to see how these ancient civilisations lived, how they hunted and what they ate,” he says. “As they were a pre-metal society we expect to find stone tools; perhaps weapons made of flint, and needles made of bone,” Dr Benjamin says. “We’re also hoping to find organic material such as plant fibers, seeds and evidence of domestic crops such as olive stones that we can date. Using cutting-edge photogrammetry techniques to create a kind of “3D mosaic”, Dr Benjamin is also in the process of generating a 3D model of the well along with fellow collaborator and world-leading expert John McCarthy of Wessex Archaeology (UK). “We had to take photos in a special way, swimming around the well in a controlled and deliberate manner in order to get full coverage for a high-resolution data set. “Photogrammetry is not just about creating a pretty picture – for maritime archaeologists it’s a tool that we can use to study the site and make archaeological interpretations. We can spend a few minutes under water, but hours on land analysing the material in very fine detail. “Israel is a great place to look at sea-level change because there are markers from 125,000 years ago on land, when sea levels were higher, but also because sea levels are constantly changing over time there are areas offshore with prehistoric coastal villages buried up to 12 metres deep, and possibly more, older material even deeper offshore.